School starts back up for my children in just about a week and we are looking forward to it so much! The summer has been beautiful, not too hot here in Michigan, and we've had a lot of fun. I've finally wrapped up my back to school shopping and I have even stocked the pantry and freezer with lots of after school snacks and easy meals. One of those snacks we stocked up on was Delimex products and the other is Bagel Bites, both from the snacks & appetizer freezer section at my Walmart. I used coupons to save even more (links at bottom of post). My oldest is 10 and she has mastered the microwave so heating these snacks up is a cinch. I love that the Bagel bites come in their own microwaveable tray and the Delimex items are easy enough to do too. We love topping our Bagel Bites with interesting things. I am sharing one fave recipe below for you to try out that my kids love to make! We preheat the oven and set out our Bagel Bites (made with real cheese and homemade sauce with 0g trans fat) and Delimex Rolled Tacos onto a parchment lined baking sheets. The Delimex get cooked and we dip ours into sour cream mixed with some salsa. The Bagel Bites get a little extra special treatment. 1. Cut up a couple stacked slices of smoked ham into 1 inch square slices and place that on each Bagel Bite. 2. Cut 1 inch square slices of swiss cheese up and set that on each Bagel Bite. 3. Bake according to instructions and then a couple minutes longer until the cheese on top is lightly golden. 4. Slice green apple into 1 inch pieces and then set a slice on top of the cheese right when they come out of the oven. I remember 2nd and 4th grade so well. I remember coming home from school, looking forward to those after school snacks. The boys always teased me and tried to pull my dress up in second grade so I think I did a lot of crying that year. In fourth grade I remember feeling so awkward going back to school because of my braces. 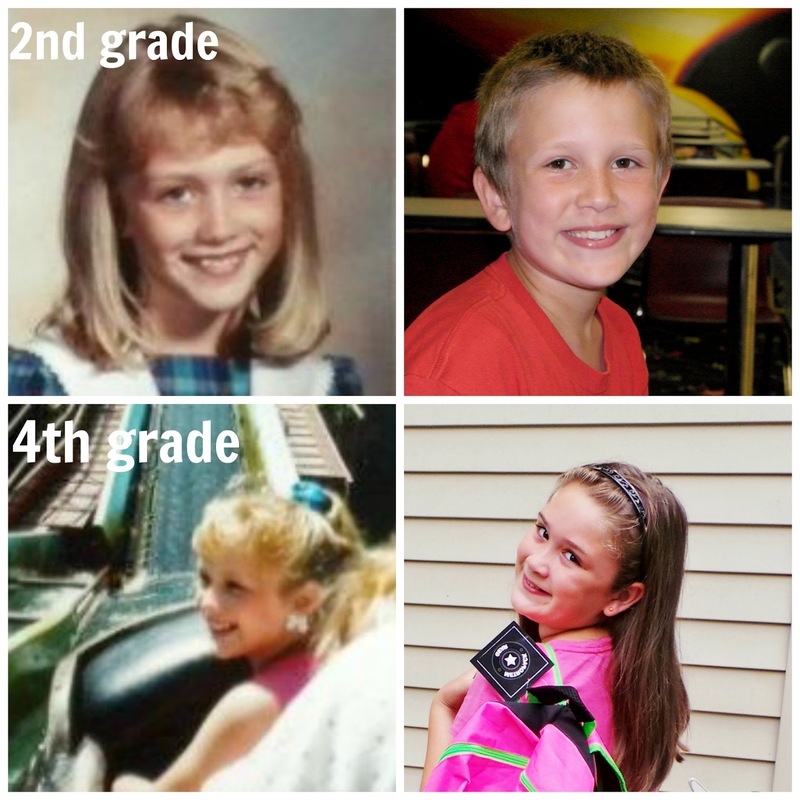 Last year my son was in second grade and my daughter in fourth so I thought it would be fun to do a side by side comparison of our pictures. I had some really poofy bangs back then ha! Got to love the 90's. I think they have it a little better than I did because I've tried to help them not have such an awkward time with school. So far it has been working and they are really confident. Check out the pictures below! Isn't it nice how clear photos can be these days? Seems like all my old pictures are fuzzy at best. My kiddos sure do look like me WOW!